The photomultiplier comprises a photocathode, in which takes place the photoelectrons emission process caused by the incident photons, and a chain of electrodes, called dynodes, which amplifies the flow of electrons which are eventually collected by the anode, causing the formation of a current pulse. The amplification of the electrons flow is caused by the voltage between the photocathode, dynodes and anode, which accelerates the electrons and causes their avalanche multiplication. The polarization of the PMT can be done in two ways: with the cathode at negative voltage and anode to ground, and with grounded cathode and anode positive. When coupled to scintillators often it is chosen the configuration with grounded cathode and the anode positive : in this case the signal is taken from the anode by means of a decoupling capacitor. The signal produced by the PMT is very short (100ns – 1μs) and of limited amplitude (100 mV), although in several cases it can reach higher values. 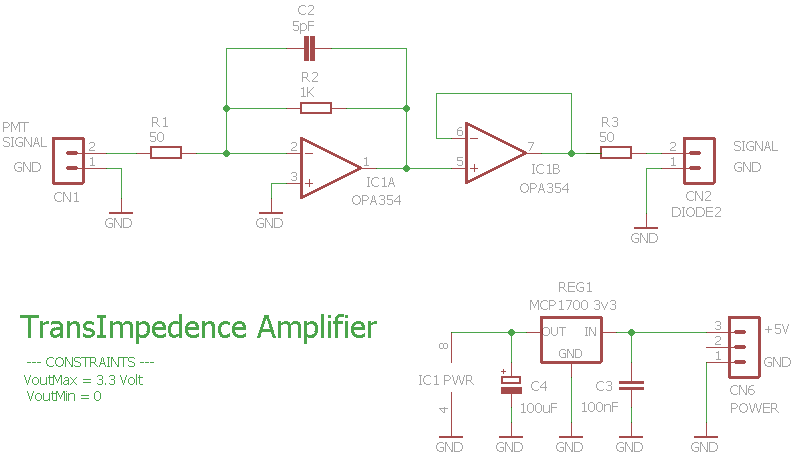 The signal is then preamplified and conditioned / shaped to make sure that the output signal has preferably a Gaussian shape with convenient amplitude and duration, in order to be easily acquired with an analog – digital converter. In the figure below is presented the complete pulse processing chain, with the charge preamplifier, the shaper circuit, the discriminator and the analog – digital conversion part. 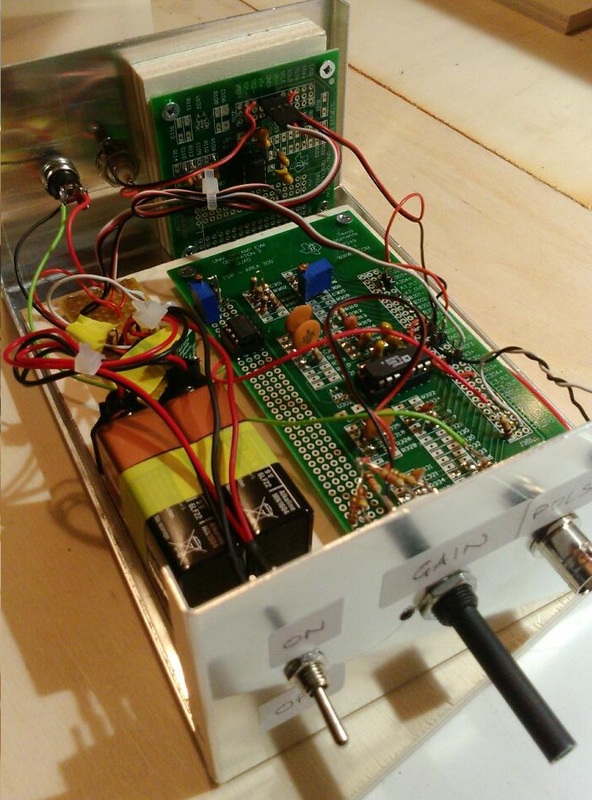 For the realization of a prototype we chose the evaluation board Texas Instrument OPAMP EVM – PDIP that allows you to create complex circuits with operational amplifiers. 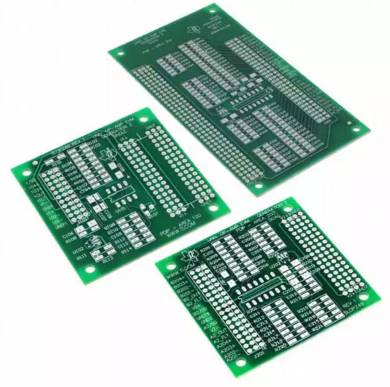 The image below shows the PCB of the board. 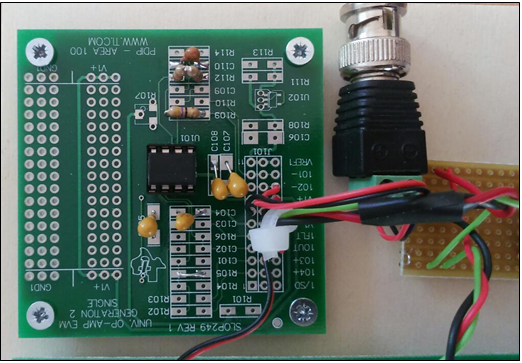 For “charge sensitive preamplifier” we have adopted the operational amplifier MC34080, wide band and with JFET input. 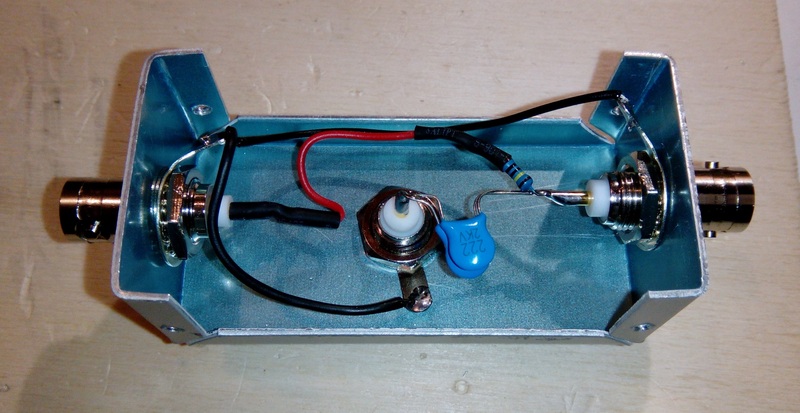 This stage is featured by an input resistance of 50 ohm and by a feedback resistance of 1,5 Mohm. 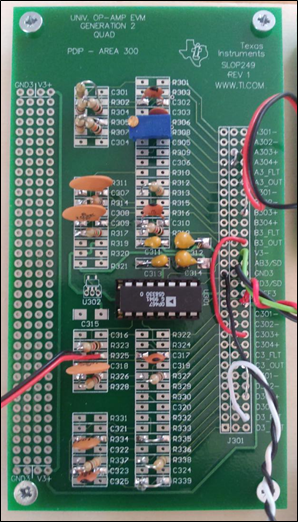 On the same board it has been put the discriminator which is realized with the comparator LM311. Using the setup above described, we have made the detection of the input and output pulses from the various stages of the signal processing chain. As can be seen from the oscilloscope traces, the output signal has Gaussian shape, with a width of about 2V (it can be varied by acting on the gain of the amplification stage) and a duration of about 100μs. 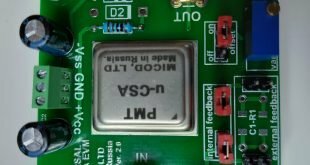 With these features it can be easily acquired by the ADC of a PC sound card. 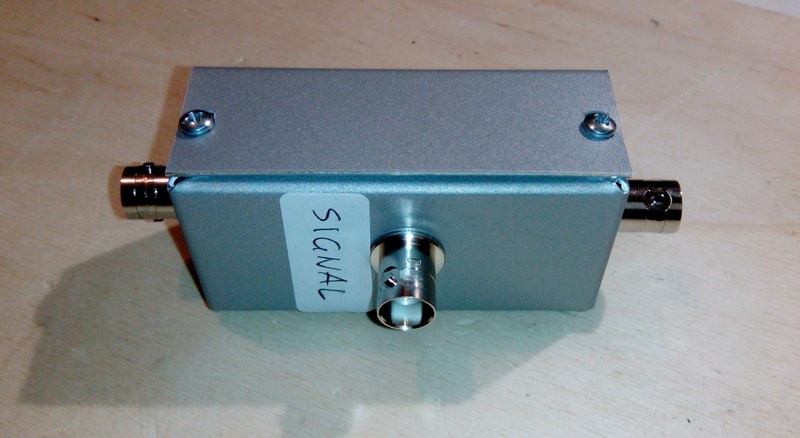 To extract the PMT signal is often helpful to use a simple device known as a “splitter”. 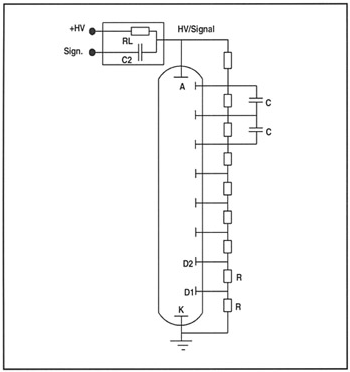 It is a high-pass filter that is inserted in the HV biasing line of the PMT and allows to extract directly the pulse signal produced by the PMT. In the diagram below the splitter consists of RL and C2 . Typical values are RL = 1Mohm and C2 = 4,7nF.